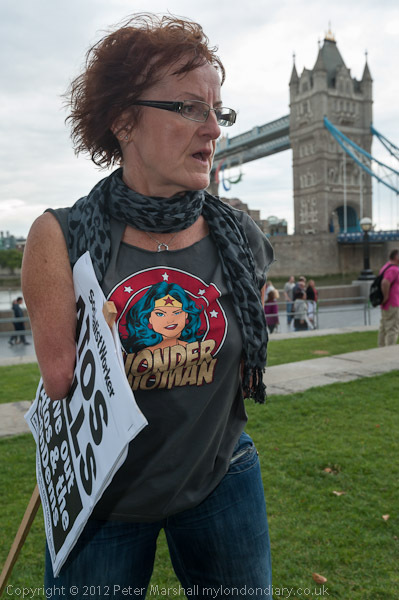 As the Paralympic Games were about to start, disabled activists staged the ‘Atos Games Opening Ceremony‘ the start of a national week of action against Paralympics sponsor Atos, whose computer based ‘fitness for work’ tests have led to stress, hardship deaths and suicides among the disabled. It was a nice idea and made more newsworthy by the participation of one Paralympic gold medallist Tara Flood (she also gained 2 silver medals, 4 bronze and set a world record for her swimming event at Barcelona in 1992.) But there seems to have been a conspiracy among our media to say no ill about the Olympics and Paralympics, and this certainly wasn’t a story they wanted to hear, or let their audiences know about. Photographically the main problem I had was in trying to photograph the actual medal ceremony where the person awarding the medal stands in front of the medal winner and lifts the ribbon holding the medal over their head. In doing so they get in the way of the face of the winner. It’s a problem that might be soluble if you were the only photographer, but here there were a dozen still photographers and around half that number videoing. But taken from the side it isn’t entirely satisfactory. 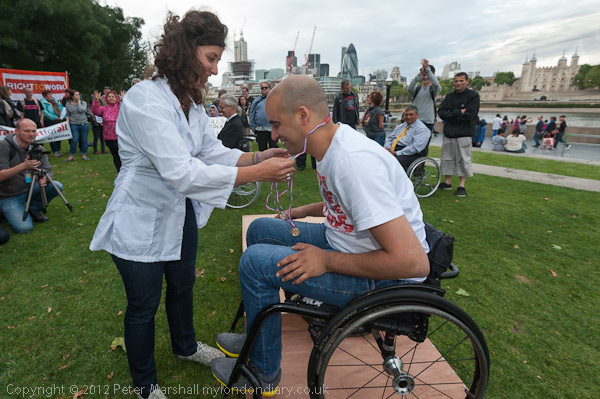 I did a little better when a few minutes later, after a stringent medical test in best Atos tradition, the winners were all found fit to work, and thus not entitled to compete and lost their medals. It’s easier because when wielding the scissors, rather than bending in and over the medallist, only the arm with the scissors stretches out towards them, and I was able to move to the right place before it happened while almost everyone else was still filming from in front of the podium. 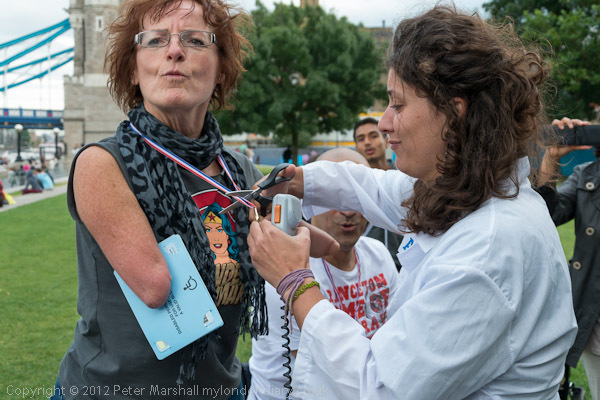 So here was Tara Flood having her Atos Games Gold Medal cut from around her neck. But this is a picture than only one or two photographers can be in the right position for, while a few dozen could photograph from in front of the podium. This entry was posted on Thursday, September 20th, 2012 at 09:31 pm and is filed under My Own Work, Photo Issues. You can follow any responses to this entry through the RSS 2.0 feed. You can leave a response, or trackback from your own site.